PARIS IS NOT ONLY the capital city of FRANCE, it is also the largest city in the country. The census of 1999 showed that although the city itself, which covers 40.5 square mi (105 square km), is relatively demographically small by world standards, having a population of about 2.15 million, the greater Paris metropolitan (aire urbaine de Paris) population is significantly larger. In 1999, it was shown to be almost 11.2 million people. In terms of its administration, the city of Paris is broken into 20 districts or arrondissements that are each governed by elected councils. Each arrondissement has its own mayor, and some local council members are also members of the Council of Paris, which serves as a municipal government and general council of the Paris département (Paris political region). Today, Paris is not only at the forefront of the French economy but also that of Europe. With its many skyscrapers in the La Defense area, Paris has a financial core that can rival that of other European powerhouses. Much of the city’s industry is based in the service sector and many multinational companies can be found within the city. Paris has a long history—the name being derived from the Parisis peoples, a Gallic tribe who resided in the area at the time of the Roman conquest in 52 B.C.E. Upon invading France, the Romans named the Parisis settlement Lutetia, “marshy place,” although within a handful of decades the settlement had another new name, Paris. Historically, Paris has centered upon a small island within the Seine River that is known as the Île de la Cité, today the site of the Notre Dame Cathedral, while urban development first took place on the left bank (rive gauche) of the Seine, which meanders through the settlement. While the history of the city is long and at times bloody, it should be understood that the settlement’s prosperity from the Middle Ages was closely tied to trade and cultural developments. 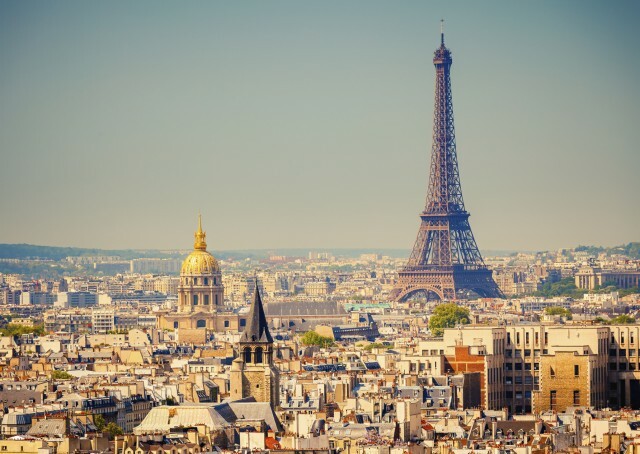 From this age, the city has become known as an intellectual center that was highlighted from as early as 1257 with the founding of Sorbonne University (formerly known as the University of Paris). However, Paris is almost equally famous for its turbulent history, none more so than during the French Revolution (1789), the Franco-Prussian siege (1870), the Paris Commune (1871), and World War II (1939–45). Topographically, Paris is generally flat because it lies on the former flood plain of the Seine River, although a number of prominent hills exist within its bounds. These include the hills of Belleville and Montmarte, the latter area famous for impressionist painting during the late-19th century and for the Basilica of the Sacré Coeur, which can be seen from almost all areas of the city. In terms of sophistication and art, few cities can match Paris and many of its museums are world famous for their collections. Visually, too, few cities can compare with Paris, with its large classical buildings scatterered throughout the city and the vast sways of buildings erected alongside braod boulevards under the redevelopment project of Baron Georges-Eugène Haussmann during the 1850s and 1860s.